Study the efficacy of phages applied on cooked, unpeeled shrimp that have been contaminated with Listeria monocytogenes. Shrimp samples of 25 grams each were treated with a dip application using two PhageGuard Listex concentrations: 1% and 5%. After this, they were artificially contaminated at two different bacterial concentrations: 1×10⁵ and 1×10⁶ CFU/g. Samples were stored for 24 hours at 4°C, time after which the bacteria were retrieved and plated on ALOA selective agar plates. Samples analyzed on day 0 (controls, blue bars), showed expected contamination levels, which were similar after 24 hours (controls, yellow bars). 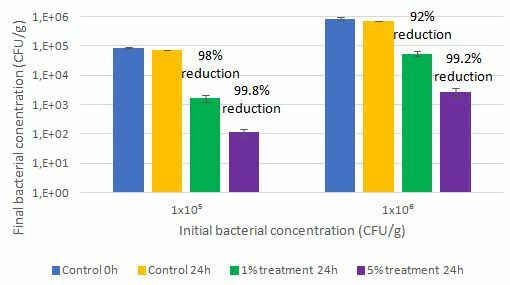 When a 1% treatment was applied, it was possible to observe a bacterial reduction of 1.1 – 1.6 logs after 24 hours (green bars). When a 5% treatment was applied, the observed bacterial reduction was of about 2.4 -2.8 log after 24 hours (purple bars). Bacterial reductions when using 1% treatment: 1.1 – 1.6 log. Bacterial reductions when using a 5% treatment: 2.4 – 2.8 log. These results demonstrate that phage effectively controls Listeria on cooked, unpeeled shrimp contaminated with L. monocytogenes and stored at low temperatures. The effect of PhageGuard Listex on Listeria is dose dependent, with bigger reductions (2.4 – 2.8 logs) when higher treatment concentrations are used (5%). At a treatment concentration of 1%, bacterial reductions were of 1.1 – 1.6 logs. 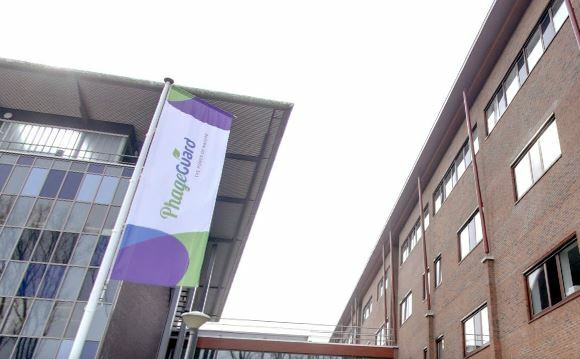 Curious to find out how Phages can improve food safety at your facility, require more information, or simply interested in discussing Phage-use? Feel free to contact us using the information below. sales@micreos.com or Contact us.